I do like English manor house mysteries. I wanted to like “Crooked House,” but overall, I didn’t. 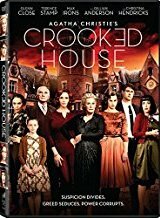 Though the sets, color palettes, and scenery were exquisite, the subpar acting abilities of a substantial number of the cast members and the lack of fairness with the audience regarding some clues made viewing “Crooked House” dissatisfying for me. There were numerous red herrings. Of course everyone is a suspect, including the guy called in to investigate the possible murder, before the cops muck in. It almost seemed like there was a checklist of sorts: Much younger, bimbo wife, check. Older, useless son, check. Younger, useless son, check. And so on, through the household. Everyone had motive and opportunity, which is usually a good thing, but in this case…who cares? No one, really. One of the so-called twists involves the dead man’s will. I felt the scriptwriter or director cheated the audience on this one. I don’t know who is responsible. I have not read the Agatha Christie novel, so I can’t say if the mistake was originally hers or if the gaff was a product of the film, but I expected better from scriptwriter Julian Fellowes, if he is the one to blame. In my opinion, “Crooked House” was woefully miscast. Charles Hayward (Max Irons) the inept detective was boring and clueless in nearly all of his scenes, most of the Leonides family members were irritating at best, and frightfully dull caricatures at worst, and then there was Magda Leonides (Gillian Anderson) – Why, oh, why did the director let her prattle on so long?!? Once we sorted through a couple of the suspects, even though they weren’t eliminated as far as Hayward was concerned, as a fidgety viewer, they were off my list. One or two of the possibilities the lackluster investigation turned up, including the theory that the dead man had arranged his own murder to confound his parasitic family, briefly held my interest. By midway through the ordeal I had a pretty good idea of who the killer might be. This, in itself, was not a problem except that the overall plot was listless due to the atrocious acting of certain cast members. It is possible to have a murder mystery where there are few, if any, likeable characters but the dynamics of the tale must be intriguing, at the very least. It’s often fun and interesting to see bad people doing bad things, in the context of a murder mystery. Also, the resolution of the mystery may leave a few untidy ends but the audience shouldn’t feel bored throughout, and/or dissatisfied with the outcome, or perhaps more importantly, feel cheated. Tim Rose Price and the director, Gilles Paquet-Brenner, are also credited for contributing to the screenplay. Perhaps that’s where things got muddled and this traditional murder mystery went astray. Copyright © 2018 Cherie Jung. All rights reserved. Reproduction in whole or in part in any form or medium without express written permission of the author is prohibited. OMDB! and OMDB! logos are trademarks of Over My Dead Body!